One of my favorite comfort food menus is a great roast dinner. However, it’s towards the bottom of the list of Ian’s things to eat. Since it’s just the two of us (because Liam won’t have anything to do with it) that will eat it, I have come up with leftover ways that I know Ian will like. The next day I make BBQ sandwiches using the beef, bbq sauce and the left over rolls from that complete perfect roast dinner. On the second night I make scrumptious beef taquitos. More simple than the chicken taquitos, but equally as tasty! Place 1 inch of oil in large pan. Heat to medium high heat. Place a little shredded beef onto the middle of a tortilla. Sprinkle with cheese. Tightly roll up. 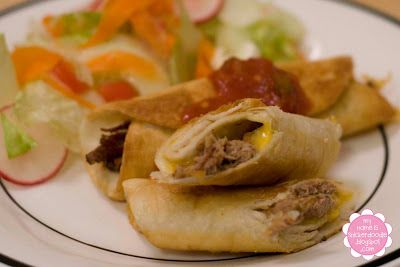 Using tongs, place taquito in oil with the seam side down. *I usually find it helpful to use the tongs to hold it down for a couple of seconds so it doesn’t unroll. Cook for 1-2 minutes on each side, until golden brown. Drain on a couple of paper towels. Serve with salsa, sour cream or guacamole. 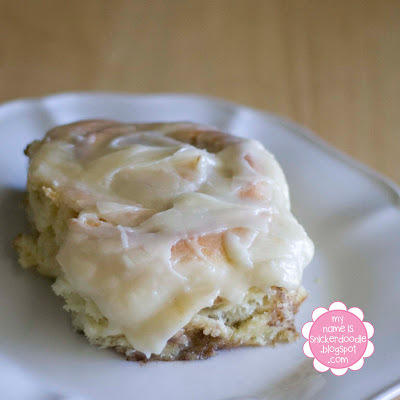 Over the past few months I have tried a few cinnamon roll recipes that I have found. Some from family, some from blogs and the internet. This one, by far has been the best. Dare I say… almost perfect. Originaly recipe found here. Her’s included a butter cream glaze, but I made mine with a cream cheese frosting. Her’s are also prettier than mine…I will try harder next time! Heat milk and 2 squares of butter together until butter is melted. Cool and set aside. Mix yeast and warm water; let stand 5 minutes. Add cooled milk, 1 1/3 c. sugar, 1 tsp salt, 4 beaten eggs. Add 4 c. flour and mix and gradually add 4 additional cups flour. Dough should be firm but sticky. Cover with cloth and put in a warm place, and raise 1 ½ to 2 hours. Dough should nearly be doubled in size. Divide dough in half and empty onto floured surface and knead a little. Roll dough into rectangle, about ½ inch thick. To this half of dough, spread on ½ square of softened butter, completely covering dough. Then sprinkle a coating of sugar over entire piece of dough. Then a layer of cinnamon. Be generous with the cinnamon; this is what makes it tasty. Roll into long roll, pinch edges together and slice with dental floss. 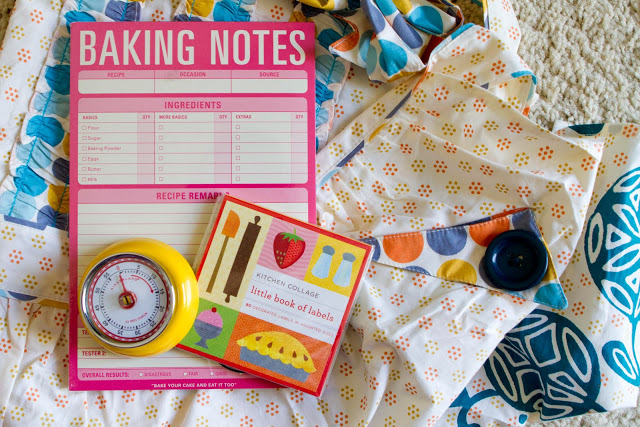 Place on a cookie sheet covered with a silpt or parchment paper. Do same thing to second half of dough. Cover with a clean dishtowel (or saran wrap sprayed with cooking spray) and put in warm place, free of drafts, for 2 to 5 hours to raise–just depends-but the should be double in size. Bake at 350° for 10 minutes or until barely browned. Remove from oven and let set for 5 minutes. 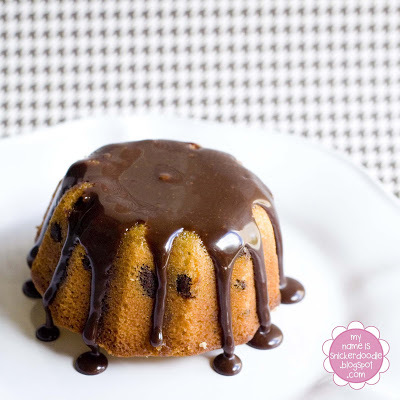 Drizzle with glaze while still warm. Makes 3-4 dozen.